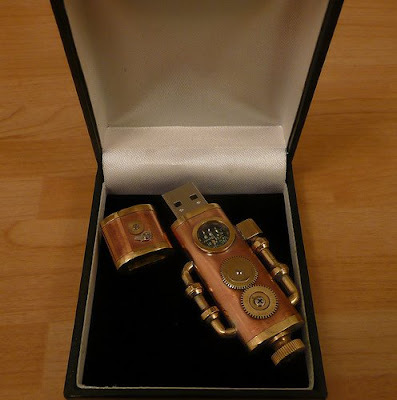 I try to keep The Steampunk Home, well, "home" focused, and USB drives are a bit outside of the home. (Mine are most in use when I'm *away* from my home.) but these two were too good not to share. took under an hour and costs under 5 dollars. I love simple steampunk projects! I appreciate the vacuum tube more. One could use cork to good effect in the stopper. The "pretend" gears on the 2nd are distracting. No functionality? No add-ons. It would be cool if the gears in the second one moved a little bit or something. As like the above commenter I do agree that the gears are distracting. I do like the tube one. Simple and easy to make. wow, such creativity!! actually, I loved the second one... if that is distraction, okay by me... great work. both are ingenious! !